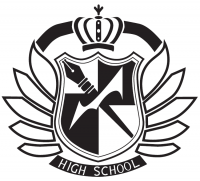 The school was founded by Izuru Kamukura in order to develop and research the talents of exceptional high school age children known as Ultimates (Super High School Level in Japanese). Unlike a typical high school, the students will not have to participate in entrance exams but instead are scouted by the school itself as Ultimate experts in their field, with the exception of the Ultimate Lucky Student whose talent was determined by winning a lottery draw. Prior to being scouted, the students had to have already been attending another high school by requirement, meaning they were at minimum 16 years old. Rather than typical school studies, students of Hope's Peak Academy were encouraged to develop their talents, with a practical exam at the end of each school year in which they would be required to demonstrate their ability. These practical exams were judged by dignitaries and experts and widely reported by the media in order to give Hope in the future to the nation. Ultimate students who successfully graduated Hope's Peak Academy had the reputation of being guaranteed success in life, with many Hope's Peak graduates holding high positions in every field of the professional world. Students must obey the EcchiDreams Terms of Services or else your death will become permanent. Students are allowed to have multiple OC and must respect each other while keeping the academy clean. Students will die but the story will repeat itself with different scenarios while the RP will be on a completely different topic.